How do boundaries shape the way we see and think? Imagine stepping into a botanical garden hothouse at night. Moonlight streams through the glass panes, illuminating creamy orchids and night-blooming cereus, glittering on the glossy dark green leaves. Your pupils dilate to take it all in. The eye allows us to absorb the tumultuous mess of visible light, the shapes and colors of our visual landscape. And yet when we look out into the world, instead of seeing nebulous whorls of stuff, we see petals, rivers, faces. We find the order in visual chaos by drawing boundaries around the disparate parts, grouping them together, and making them whole. At the primary level of vision, our eyes find and exaggerate edges at the point at which they appear on the retina. Retinal ganglion cells act like on-off switches, responding to the contrast between light and dark. Each of these cells receives input via separate tiny apertures, resulting in limited individual data that is useful only when integrated. Neighboring neurons inhibit each other; at the boundaries between two flat shades of grey, this inhibition emphasizes borders and contours, creating the ripples and highlighted peaks known as the Mach Band Effect. Our minds also shape and exaggerate the boundaries that our eyes draw; how we think shapes what we see. When we think of a mushroom, we think of only the little cap and stem that we eat, not the massive rhizomorph that sustains the fungus across several underground square miles. In the first half of the twentieth century, the ecological psychologist J.J. Gibson was developing a relational theory of visual perception, based on this exchange between objects and thoughts. His affordance theory states that organisms perceive the world not only in terms of the shape and relationship between objects, but also based on how an object can be used. A branch can be differentiated from a tree because of its swingability, the mushroom from the mycelium because of its edibility. An affordance is not an inherent quality of any one thing, but lies in the relationship between object and subject. Gibson’s relational model of cognition was a radical departure from the psychological status quo of his time. Up until the 1950s, scientists understood perception as happening when the brain extracted meaning from the image of an object formed on the retina. To Gibson and other psychologist-philosophers, laboratory tests that relied on hyper-controlled and isolated stimuli could not properly model the variable and fluid nature of reality. Such closed-off experiments would lead to artificial conclusions about the nature of consciousness in a messy world. Likewise, the Gestalt psychologists used “biotic experiments” to extrapolate their laws of perception through real-world situations. The Gestalt laws define a theory of awareness as holistic instead of analytic: The whole is other than the sum of its parts. Like the sphere in the Gestalt image above, an object can be perceived even in a space where no sensory information is provided. Our brains fill in the gaps and we see things that aren’t there. R. C. James’s image ‘Dalmatian’ famously demonstrates the Gestalt law of emergence. The viewer is presented with seemingly random splotches of ink that have no meaningful borders. Rather than identifying the pieces of the Dalmatian first, the shape of a Dalmatian sniffing the ground emerges all at once when the brain categorizes some of the shapes as belonging to the foreground and some as belonging to the background. It does this by looking at the proximity and similarity of certain shapes and folding them into the culturally-acquired expectation that 1. There is something to see in the constructed image; 2. Dalmatians are spotted; 3. Dogs sniff the ground; and so forth. 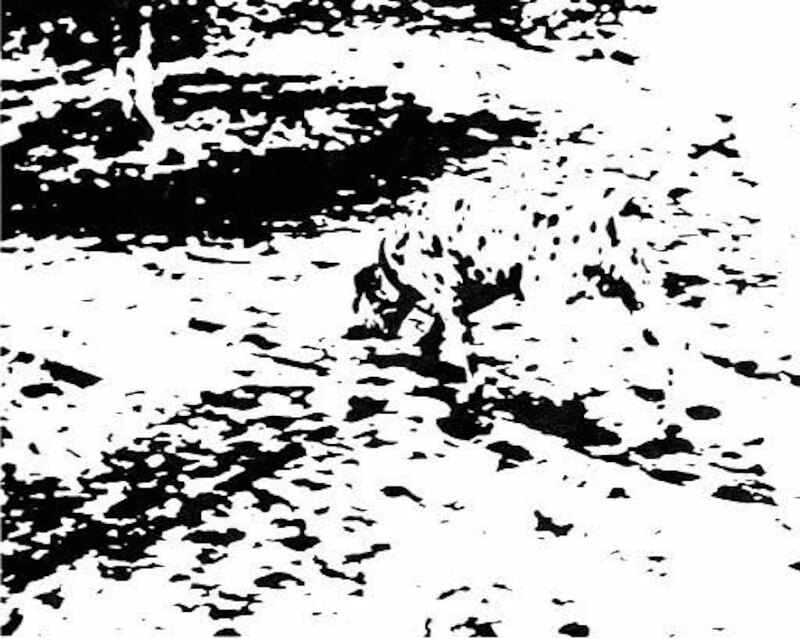 The Dalmatian only comes into view when the image is seen concurrently as a whole, versus an additive process. Back in the hothouse, you see moonlight glimmering in a black pond. Something is creating ripples and waves in the water, but it is too dark to see exactly what. You squint your eyes toward the motion for more information. When the cells of your retina receive insufficient or ambiguous contrast information, the brain begins to apply perceptual boundaries to what is otherwise visually undifferentiated. We create meaning from ambiguity by noticing that even when an object or surface transforms (through an angle tilt, for example), it retains invariant properties: ratios of light intensity, gravity, the penumbra of shadow, or functional affordances. In the hothouse, you can approximate the location of the ripples based on the uniform rate of change in light as it radiates from the source. Soon the ripples die away and you look elsewhere, not having enough information to understand what caused the disturbance. Focus on the black cross as the empty spot traveling around the ring of pale lilac dots. Gestalt theorists were the first to identify how our mind transforms the still images of this animated GIF into a moving picture. As you continue to stare at the cross, a secondary phenomenon manifests: the empty space becomes a green dot circling the lilac, rapidly eating them until all that is visible is the gray background underneath. This intriguing secondary effect happens because the brain is lazy and tends to habituate to static stimuli. Staring at one spot means that the information presented to each neuron does not change. The brain adjusts to it rapidly, in the same way that you don’t register the sensation of your clothes on your body seconds after you put them on, or how you stop noticing the smell of food cooking as you stand in the kitchen. Staring at the center makes the peripheral lilac dots disappear, coloring in the space with the surrounding grey. However, the circling green dot remains as an afterimage of the lilac. The resulting effect is very different from the actual stimulus. Like in much of neuroscience, we’ve also learned a great deal about how thought and vision are connected by looking at cases in which they work differently. One of the most reliable symptoms to aid in the diagnosis of schizophrenia and other psychotic disorders is the reduced capability to fixate, or hold a steady gaze on a single unmoving object. People with schizophrenia are more likely to have trouble smoothly following the motion of a moving object, instead displaying a jerky back and forth motion of the eyes called a saccade. Saccades make integration of relative information about the environment more difficult, which may lead to divergent thoughts and incorrect conclusions. Even at an anatomical level, postmortem dissections show that individuals with schizophrenia have a 25% reduction of neurons in their visual cortex. The way we see influences the way we think. Disruptions in integrating information can have major effects both visually and verbally. People with schizophrenia often describe their visual field as being fractured and disjointed, reporting that they only see parts of objects instead of the whole thing. Similarly, a hallmark of schizophrenic speech is “knight’s move thinking,” or sentences that don’t follow a logical syntax, composed of thoughts and words that are only tangentially related. When objects seem isolated from another, the brain struggles to connect them, resulting in novel and oblique links. This craving for associative meaning—and the resulting tendency toward paranoia—extends far beyond those with psychosis. Apophenia is finding meaning in meaninglessness. We are evolutionarily incentivized to come to quick conclusions about whether the motion of rustling grass is really a snake, so much so that sometimes we can really see the snake. While it’s not particularly costly to be wrong about the snake and jump away for no reason, constantly seeing invisible snakes can make it very difficult to lead a normal life. Gestalt theory describes how we see what isn’t there, helping us to make sense of the world. But these principles can also fail us; an over-reliance on these perceived boundaries creates a fractured picture of reality. Today Gestalt theory has fallen out of style amongst cognitive psychologists. Without the rigorous controls of the prototypical lab experiment, Gestalt theory was unable to tease apart the specific neural mechanisms underlying perception, remaining descriptive rather than analytic. However, Gestalt principles maintain an important place in our understanding of cognitive function and dysfunction. They illustrate a progression from boundaries to objects to concept segmentation, culminating with integration into a full picture. They blur the boundary between the way we see and the way we think. In that way however, the biotic experiments of Gestalt psychology can tell us something about the practice of science and the ways we see and think in the laboratory. Where we draw boundaries, define variables, and set controls shapes how we understand and interpret experiments. When dealing with complex systems like human consciousness, approaching the boundaries of truth may be the best we can hope for. You may never find out what the ripples in the pond are, but you may approach understanding when you see tiny dark purple blooms floating on the surface in the morning light. Jayinee Basu is a writer based in San Francisco. A book of her poems entitled Asuras is forthcoming from Civil Coping Mechanisms.